Calculator, Clock, and Gadgets is a pretty interesting app for Windows 8 that combines a clock, calculator, notepad, and internet search within the same app. You can snap this app to sidebar of Windows 8 to have all these utilities handy, and keep working on other apps in the main interface of Windows. This app provides a basic calculator, an infinitely scrolling notepad, date, day, current local time, current GMT time, and option to search Google, Bing, Yahoo, or YouTube; all from within the same app. 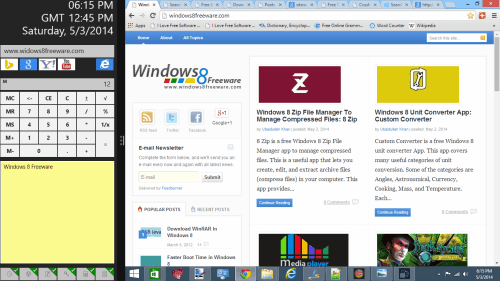 This app is available in Tools category of Windows 8 App Store. You can get this app from the link given at the end of this review. When you run this app, you will see that app the features are available in the center of the app, while Left and Right side are primarily blank. This is because the app has been primarily designed to work in the snapped mode, so that you don’t loose any functionality even when you are running this app in the snapped mode. 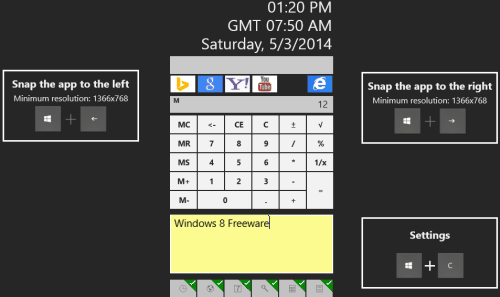 The app neatly arranges calculator, notepad, search option etc. in snapped view, one below the other, so that you can use all of them easily. Web Search: This option gives a search box at the top in which you can enter any search term. After that, you need to click on the icon of the search engine in which you want to perform the search. You can choose to perform the search on Google, Yahoo, Bing, or Youtube. When you click on any of these icons, the corresponding search engine opens in your default browser, with search done for the search query you entered. Calculator: The app also provides a basic calculator that lets you perform all calculations, and comes with options for M+, M-, etc. It does not provides feature to do any scientific calculation; for that, you can try these apps. Notepad: This app also provides an infinitely scrolling notepad in which you can make notes. Whatever you write here will stay even if you close the app. However, you cannot save the notes as a file. Also, only one set of notes can be made. This is basically to take some notes about the task that you are doing, so that you don’t forget that. You can add as much text as you want and the notepad will keep scrolling vertically. Also, the initial text of the notepad is available as a Live Tile in Windows 8 Start screen as well. Date, Time, GMT Clock: The top of the app shows you current local time, current GMT time, and day / date. The app also provides some icons at the bottom which let you control which of these components actually you want to see. For example, if you don’t want to see GMT time, you can uncheck the icon for that. Similarly, you can enable / disable any of these components. Also check out some other notepad apps we reviewed earlier, including this multi-functional app. I find this app useful for lot of scenarios. This can definitely give a nice productivity boost. I also like the fact that the app is specifically designed to work in Snapped mode, so that you can use this app in conjunction of anything else that you might be doing. Get Calculator, Clock, and Gadgets app here.